Player of the week R14: Marsh Watch Jonathon Marsh's best moments from the weekend's game against Fremantle. Jonathon Marsh played 15 senior games in three seasons at the Holden Centre. The 21 year old informed the club last month that for personal reasons he wanted to step away from the game at the highest level and return to his home state of Western Australia. 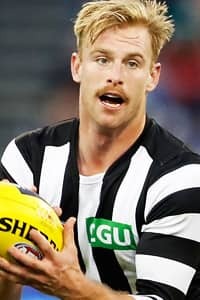 Collingwood General Manager of List Management Derek Hine said Marsh had since been in regular contact with the club and continues to feel that it is in his best interests to remain close to family and friends. “Jonathon is a young player of promise and we respect his decision to step back from AFL football and to be closer to his support network back home,” Hine said. Marsh played 15 senior matches in his three seasons at the Holden Centre after being drafted in the fifth round of the 2013 national draft. With the departure of Marsh, Collingwood will take five selections – picks 28, 44, 51, 62 and 65 - to the National Draft on November 25. LIST NEWS: Keeffe promoted to senior list.